There’s a whole head of garlic up in these cyber pages. By now you should be able to smell it through the screen. I know. You have boys to kiss. Important business meetings and no Altoids. You don’t have time to smell like garlic. But indulge me for a moment, please. 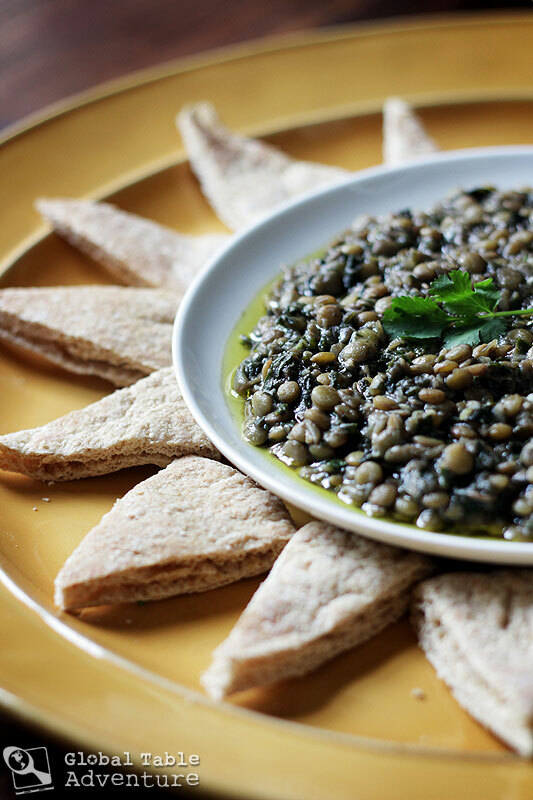 We’ve eaten a whole head of garlic on this Adventure before, as with our Lebanese garlic sauce Toum, but this time our garlic is making friends with lentils and Swiss chard. They bubble and steam up together, considerably mellowing out the flavor. To round out the flavor, there’s a squeeze of fresh lemon juice, a splash of pomegranate syrup, and a pile of cilantro. (To my cilantro haters: don’t worry, the offending leaves get waaay cooked down. 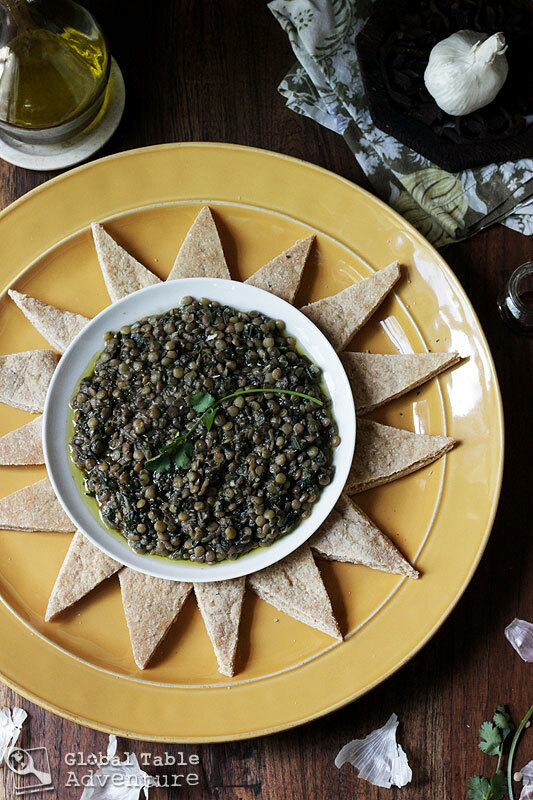 If you can eat Salsa, you can eat these lentils). 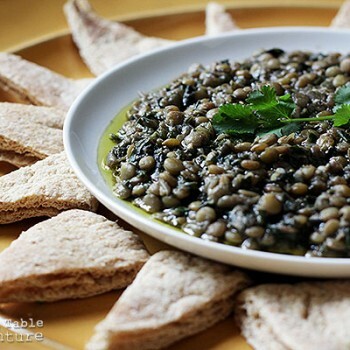 The result is a lovely warm lentil side dish or dip (best enjoyed with homemade pita bread). I even like it cold, with salad. And it’s definitely better the next day, although you might want to “refresh it” with another squeeze of lemon juice and another sprinkling of salt. Adapted from A Mediterranean Feast by Clifford A. Wright. Heat olive oil in a large skillet. Add garlic and cook for a minute until fragrant. Add in the thinly sliced chard and de-stemmed cilantro leaves (reserve a bit of cilantro for garnish, if desired) and cook another two minutes. Add the cooked lentils, lemon juice, and pomegranate syrup and cook until the lentils are a bit mushy, about ten more minutes. Add water as needed to keep the mixture loose and to keep it from drying out. Season really well with salt, to brighten up the flavors. Serve warm with an extra drizzle of olive oil and wedges of pita bread. Perhaps with a kitty cat… perhaps with a view. Panorama of Damascus. Photo by Wurzelgnohm. P.S. Do you eat garlic whenever you like, or – is there safety in numbers, and you only do it when other people are indulging? 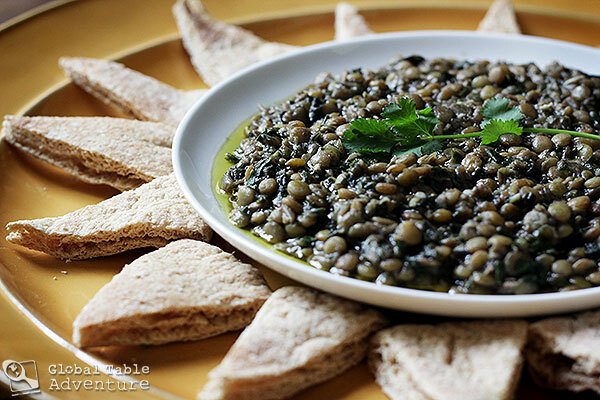 a lovely warm lentil side dish or dip (best enjoyed with homemade pita bread). I even like it cold, with salad. And it’s definitely better the next day, although you might want to “refresh it” with another squeeze of lemon juice and another sprinkling of salt. Heat olive oil in a large skillet. Add garlic and cook for a minute until fragrant. 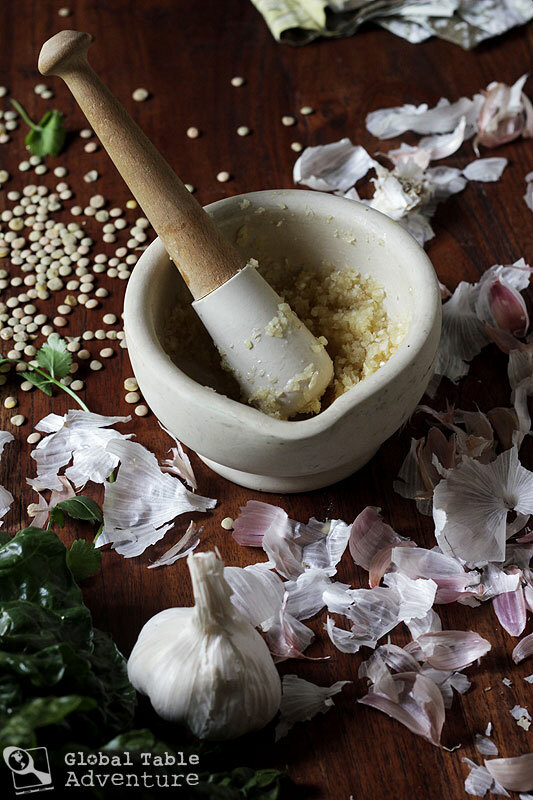 TIP: Clifford A. Wright, whose recipe I adapted, says that the flavor is not the same if you don’t pound the garlic in a mortar and pestle. I cut the work in half by crushing it into my mortar and pestle, then banging it out for the rest of the way. Season really well with salt, to brighten up the flavors. Serve warm with an extra drizzle of olive oil and wedges of pita bread. Love your website. I have used many of your recipes. 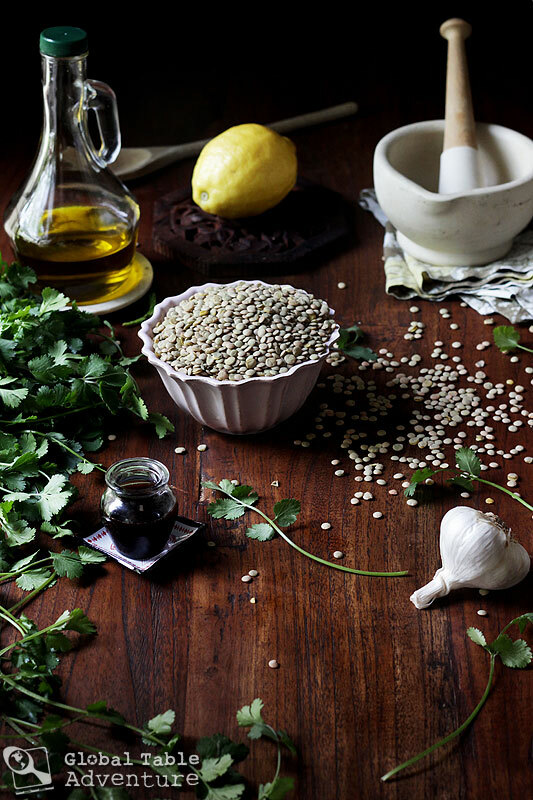 Oh, these lentils are calling to me – even with all the garlic! 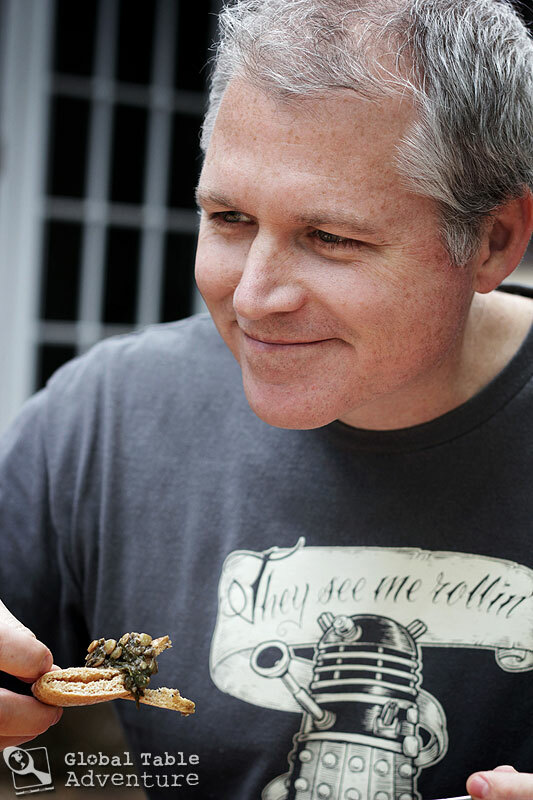 I use garlic liberally when cooking, but that is also the norm here in Brazil where we are living. I can’t find pomegranate syrup, so can I substitute something or just leave it out? As an aside, I love your colourful mismatched plates! So cheerful! Love your “sunflower” presentation…so pretty! These look & sound so good I think I’ll try them even though I’m not a big bean/legume person. Yes, tips out is quite fun. I got the idea from a different Syrian recipe (the meatballs in sour cherry gravy), but thought it worked well here, too. Wow… more garlic! Wonderful, Evelin 🙂 Glad to have your feedback… and happy you enjoyed it! Delicious! I can’t wait to have the left overs today. I microwaved the garlic for about 45 seconds to speed up the peeling process. Worked great! This looks so yummy! I’d love to try it. Can you tell me where you got the pomegranate syrup in Tulsa? I went to Whole Foods on Brookside and couldn’t find it, and they told me they don’t carry it! You can buy their pomegranate concentrate, near the juices; it’s very similar. Can you use pomegranate molasses instead of syrup? We made this for dinner tonight and loved it! Thank you for this beautiful recipe. I work for Preemptive Love Coalition—a nonprofit based in the Middle East. We are a relief and development organization actively involved in helping people affected by the war in Syria. We want to help people in the U.S. stay engaged with the crisis and thought of using the connecting power of food to do that. Will you help us in this effort? Tragically, many people in the west only think of Syria in terms of destruction and war. They have no idea about its beautiful culture and ancient history! We hope to challenge that misperception and highlight our shared humanity by creating a series of articles about pre-war Syria that include pictures, recipes, and stories. 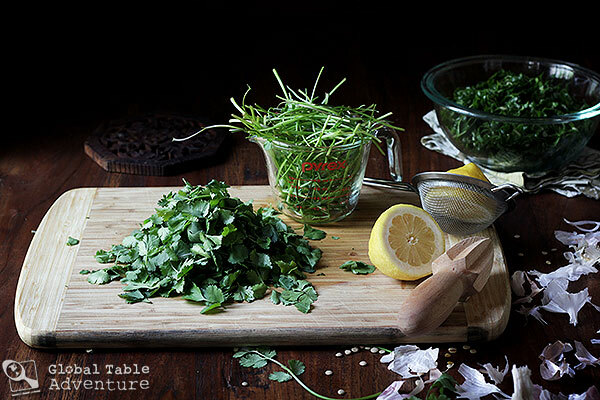 While searching for Syrian recipes, we came across your beautiful blog. Would it be ok if we shared your site with our people and linked back to it? We’ll feature some Syrian food bloggers as part of this piece and would love to include you in that. We also want to talk about what displaced families eat today. One of our programs in Syria is an emergency food kitchen that feeds 31,000 people a day. 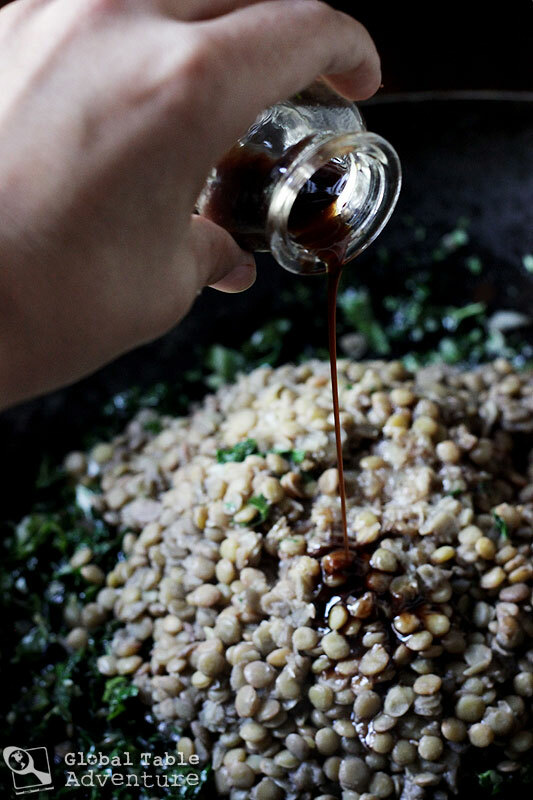 Most of the time, they serve simple versions of traditional Syrian dishes like mujadara. 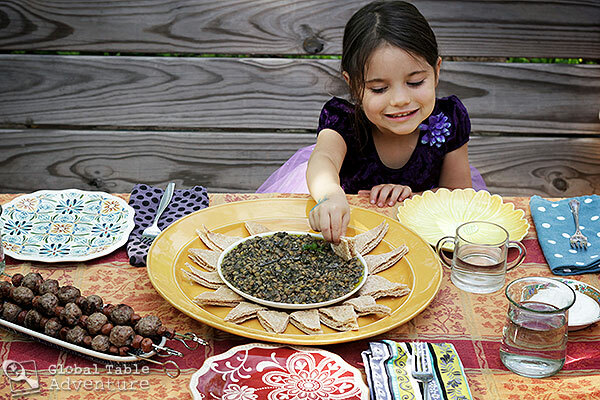 We would love to build empathy by encouraging people to make a simple Syrian dish like that. Would you join us in our effort to build bridges, foster empathy, and create a more beautiful world? We thought of several ways we could collaborate but would love to hear your ideas as well. We thought perhaps you could repost or share our story when it runs (hopefully within the next 3-4 weeks)? Or write your own post about these issues? 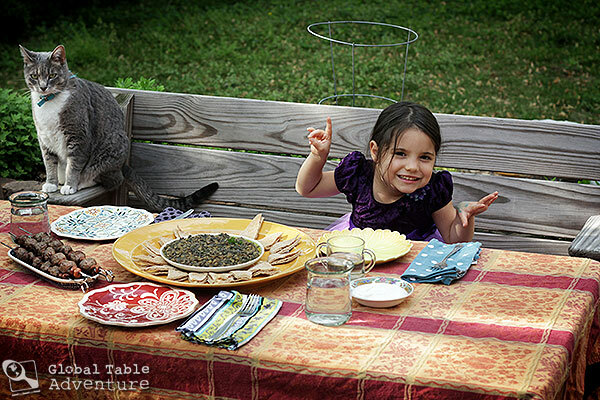 Or share another simple, Syrian recipe that you think everyone should try? We would love to hear your ideas. Thank you for your time, and please let us know what you think.